Putting the Apple TV app on non-Apple devices makes sense now the company is reselling SVOD. However, the SVOD service Apple TV+ will struggle against Disney+ and Netflix even with Oprah and Steve Spielberg providing content. Chris Stern, Apple’s VP of Services, demonstrated the newly redesigned Apple TV app at the company’s press briefing from Apple’s campus on Monday. The new app blends all the content available to the user into a unified experience. 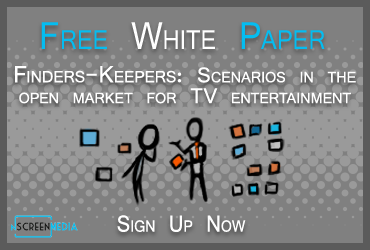 Content can be viewed by categories including movies, sports, and kids. Also, editors provide direct access through recommendations lists to the “best” content available at the time a user is browsing. Content available through the app include all iTunes movies and shows. 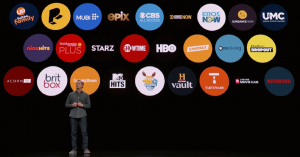 Pay TV services Spectrum, DirecTV, and Optimum are also integrated with the Apple TV app, as are vMVPD services Hulu Live, PS Vue, and FuboTV. Apple officially announced its entry into the SVOD aggregation space through the new Apple TV app. The company is reselling 25 SVOD apps including CBS All Access, Showtime, HBO, BritBox, EPIX, and Shudder. App users will be able to subscribe with one click, watch all content ad-free, and download shows from all services for offline viewing. Borrowing from Amazon, the company calls its SVOD aggregation service Apple TV Channels. Along with the redesign and the ability to subscribe directly to 25 TV apps, the Apple TV app will break new ground for the company. In addition to being available across all Apple devices – including the Mac in the fall – it will be available on smart TVs. Starting with Samsung, the company plans to release it on Sony, LG, and Vizio TVs. As well, it will be available on Roku and Amazon Fire TV. The move to put the Apple TV app on platforms like Roku and Amazon Fire TV complicates an already confusing picture for consumers and SVOD providers. SVOD providers must figure out if it is better to acquire a customer through iTunes billing (giving a 30% cut to Apple) in the Apple TV app on Fire TV or through Amazon Prime Video (with a similar charge for billing) on the same device. Similarly, the SVOD provider needs to know if The Roku Channel represents a better deal than the Apple TV app on Roku. Consumers must figure out which ecosystem to which they want to commit. If they sign up for Showtime through Apple TV app, The Roku Channel, or Amazon Prime Video, they will need those mobile apps to watch the content on their mobile device. Apple will launch a subscription streaming service in the fall of 2019. The company spent almost half of the press conference allowing the creative talent to present the shows they are producing for Apple TV+. Steven Spielberg talked about a new version of Amazing Stories. Oprah discussed two documentaries she will be producing. Other contributors include Jennifer Aniston, JJ Abrahms, and Ron Howard. Apple’s new SVOD service will face entrenched competition from Netflix, Amazon, and HBO as well as new services from Disney, WarnerMedia, and NBCU. With so much competition, Apple will have little room to maneuver with how much it charges for the service. As of now, the eclectic mix of general entertainment and documentaries that will be available sounds too thin to be credible against the competition. Hopefully, Apple can bolster the originals by licensing plenty of additional content to help it prosper in the 100+ countries in which the service will be available. Apple confirmed it would sell SVOD services through its newly revamped TV app. To boost the apps reach, Apple will make the app available on smart TVs and competitor platforms like Roku and Fire TV. The company will launch an SVOD service in the fall anchored by content from Hollywood heavy-hitters like Oprah and Steven Spielberg.